Last night I moderated the #games4ed live chat. Little do anyone know, this was my first time to host a Twitter chat. O.o I’ve had a lot of fun on Twitter recently. First I remotely participated in a conference and then I published my first set of open Twitter data. Not to mention joining the #games4ed live chats and meeting many awesome people: Melissa Pilakowski, Steven Isaacs, Mark Grundel, & PBJellyGames, to name a few. With all of these experiences, I felt prepared to moderate a Twitter chat for the first time. 1. Brainstorming topics & questions – After Melissa asked if I wanted to host a night of #games4ed, I started thinking about what subjects I wanted to do. 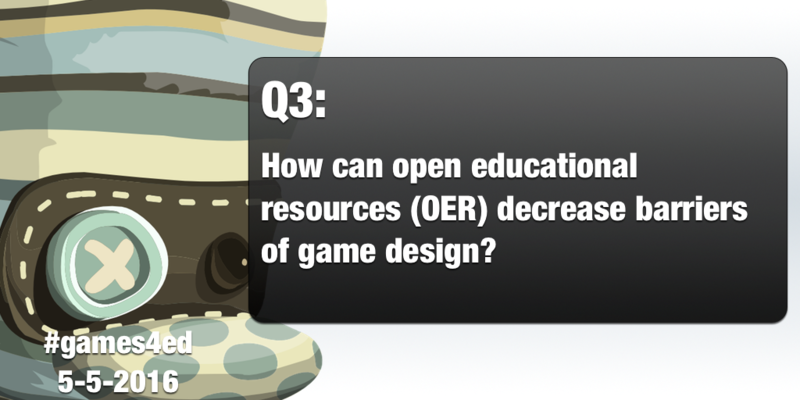 Eventually, I decided on Open Educational Resources (OER) and Game Design. John Stewart and I had just recently finished GOBLIN, which was built as an OER table-top game to teach professors about gamification and game-based learning. All of these ideas were fresh in my mind and I wanted to hear other educators contribute to this conversation. 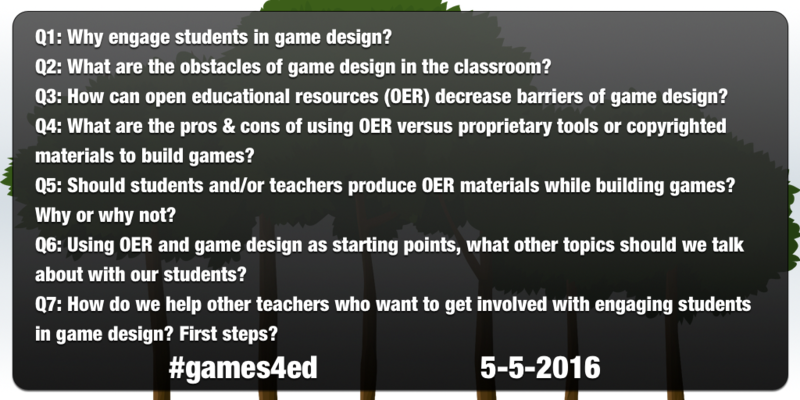 I am glad I selected this topic because #games4ed has not covered OER yet. So, I was excited to be the first! 2. Creating question graphics – #Games4ed uses images to showcase the questions each week. The advantages of this approach means questions can be longer than 140 characters and graphics are easier to see among a sea of tweets. Additionally, I wanted to emphasize the OER theme for the night. So, I ended up using artwork from the public domain game Glitch to build the graphics. Some of the assets were used in GOBLIN, so I was familiar with the resources at my disposal. Finally, to edit the graphics, I used Pixelmator (a streamlined photoshop-like software) and I believe the graphics turned out great! 3. 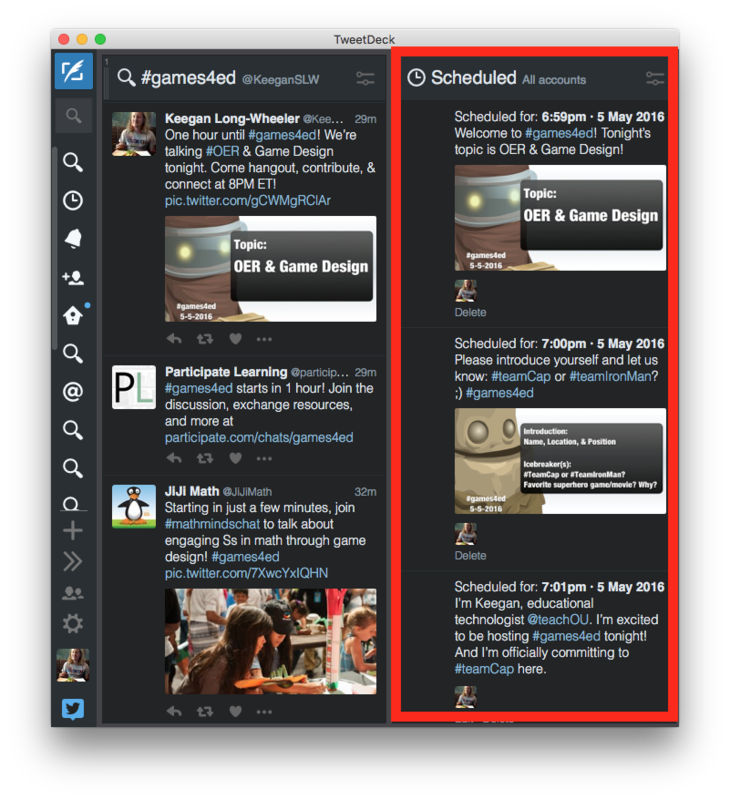 Scheduling Tweets – One of my major concerns for moderating was getting overwhelmed by the number of tweets I felt required to produce. Therefore, I removed all of this stress by using Tweetdeck schedule tweets feature. First, I calculated how to spread seven questions across one hour—I determined to start questions at 8:05PM ET and reoccur every eight minutes. Next, I scheduled other tweets I thought were relevant for the chat including an introduction and links to OER resources. In other words, I intended to limit my focus to the tweets of the participants. List of my scheduled tweets in Tweetdeck. Scheduling tweets is the only way to keep up with the conversation. As a moderator, I want to welcome and make as many people feel at home as possible in the Twitter chat. Between being hospitable and attempting to hold a dozen conversations at once, having my own questions and answers running in the background helped me stay on track. Begin moderating Twitter chats in small circles. The #games4ed live chats are sizable with anywhere from 25-60 participants. (Last night included 37 users.) In contrast, there were nearly 400 participants #oklaed on Sunday evening. If you want to host a Twitter chat for the first time, I recommend starting with a smaller community. A manageable live chat let me practice moderating and I had a positive experience hosting. Inviting friends makes the event more fun! I gave some of my friends access to the questions for the night and although they couldn’t be present, they scheduled tweets to sync with my questions. This generated more ideas and their support was encouraging during the live chat (shoutouts to John Stewart and Jason FitzSimmons). I need to practice keeping up with the conversations. During the chat, I fell behind a couple of times as I was attending to earlier tweets. I know this is inevitable in a Twitter chat, but since hosting I want to improve my response time in future sessions. A core group of participants helped engage more users. Since it can be difficult keeping track of everyone, I am grateful to the regular participants for helping supplement my engagement. Melissa and Steven, were especially helpful during this session as they insured participants didn’t slip through the cracks. I enjoy live tweeting! This was an awesome experience. From brainstorming questions to connecting with educators, I discovered that I value the process of moderating Twitter chats. I can’t wait to host another! 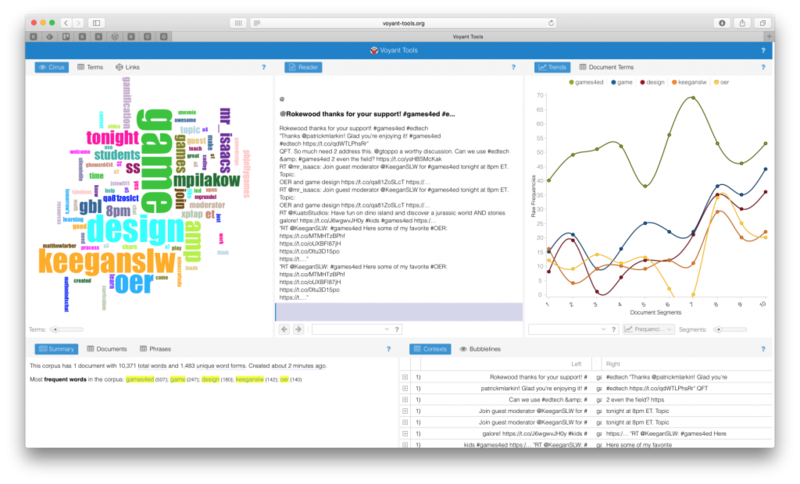 If you want to analyze this data I suggest a tool like Voyant-Tools 2.0. For more information on collecting or visualizing tweets check out my post on Open Twitter Data. Tweets from this #games4ed Twitter chat in Volant-Tools 2.0. Thank you everyone for making my first moderated Twitter chat a positive experience. I look forward to more of these opportunities to connect and discuss with other educators from across the world! If you copy Keegan’s Open Twitter Data into a copy of Tags 6.0, you can run all the visualizations off of it.